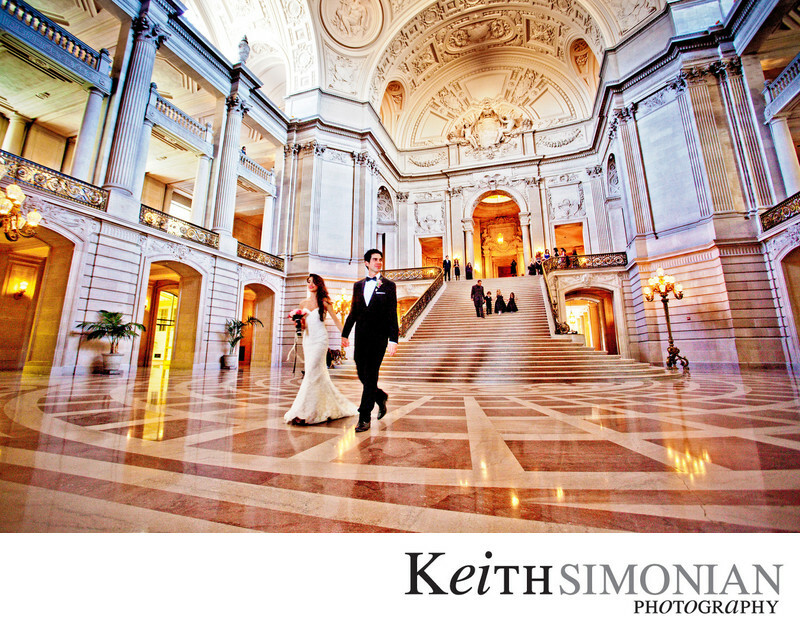 Most city hall weddings are done without much fan fare and never with the stunning views that the San Francisco city hall offers. Here the bride and groom lead the wedding procession down the steps into the beautiful rotunda of San Francisco city hall. The use of an ultra wide 17mm Canon lens allowed me to capture almost a 180 degree view of the building and the couple's walk through it. The original San Francisco City Hall was destroyed in the 1906 earthquake. The reconstruction of the current city hall started in 1913 and was completed in time for the 1915 Panama-Pacific International Exposition. Location: City and County of San Francisco City Hall United States 1 Dr Carlton B Goodlett Pl San Francisco, CA 94102. 1/50; f/4.5; ISO 2000; 17.0 mm.